Raphael’s set includes set includes the Turtle’s authentic ninja weapon (2 complete Sais) and signature bandana that will help transform you into your very own hero in a half shell! Please search code 125409 to check stock availability in our stores. This toy costs approximately £14.99 (for the latest and best prices make sure you check our retailer list for the Turtles Role Play Combat Gear Raphael above). 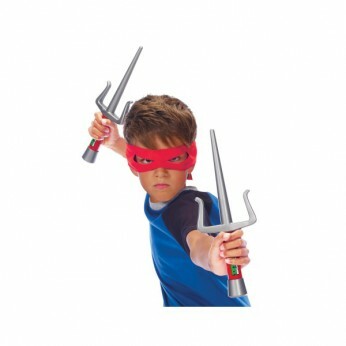 In our review of Turtles Role Play Combat Gear Raphael we classed it as being suitable for ages 4 years, 5 years, 6 years, 7 years, 8 years but recommend you check the manufacturer specific advice before purchasing.